Do not store chemicals in food containers. Use chemical bottles (you can get them at your local drug store) and label them properly. Do not store chemicals in your kitchen or any other place that might be accessed by an unsuspecting person. Disclaimer: This is a do-it-youself guide and you follow the instructions at your own risk. I cannot be held liable for any effects your actions might have, including injury or damage. 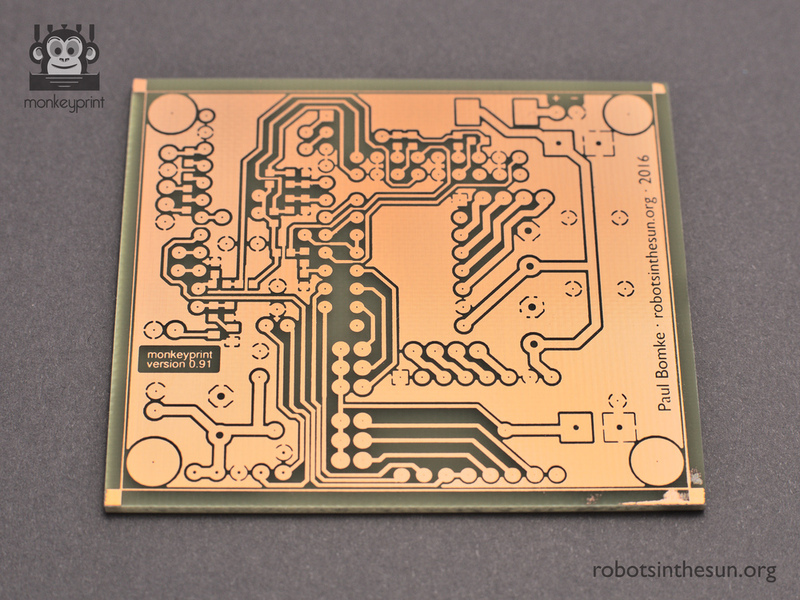 There are several ways of making a PCB from a copper plated board. All of them involve masking the traces and pads by some sort of etch resist and then etching away the unmasked parts of the copper. 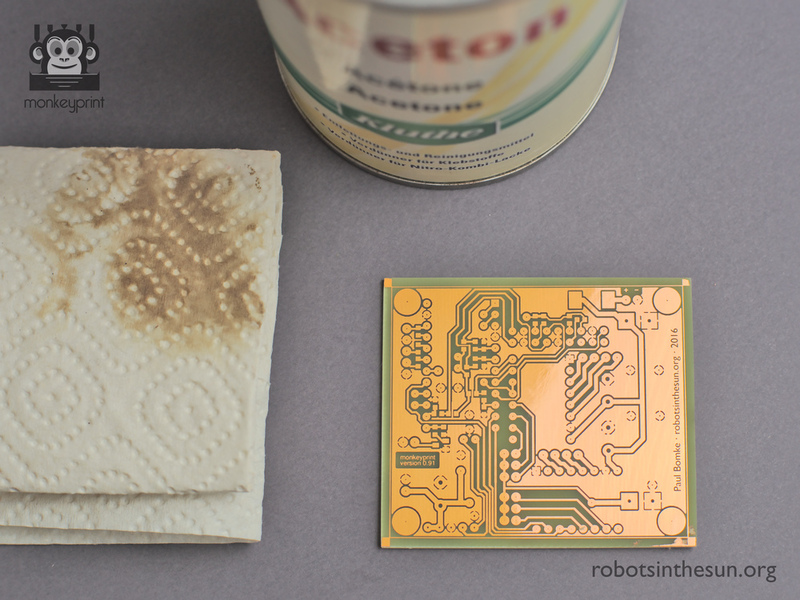 The difference lies in how the etch resist comes onto the board. You can paint the layout onto the board using etch resistant markers, you can use the toner transfer method or you can use boards that come with a photo active etch resist and need to be exposed and developed before etching. Get the layout transferred onto an exposure mask. Expose the board using the mask and develop it. Tin coat and drill the board. 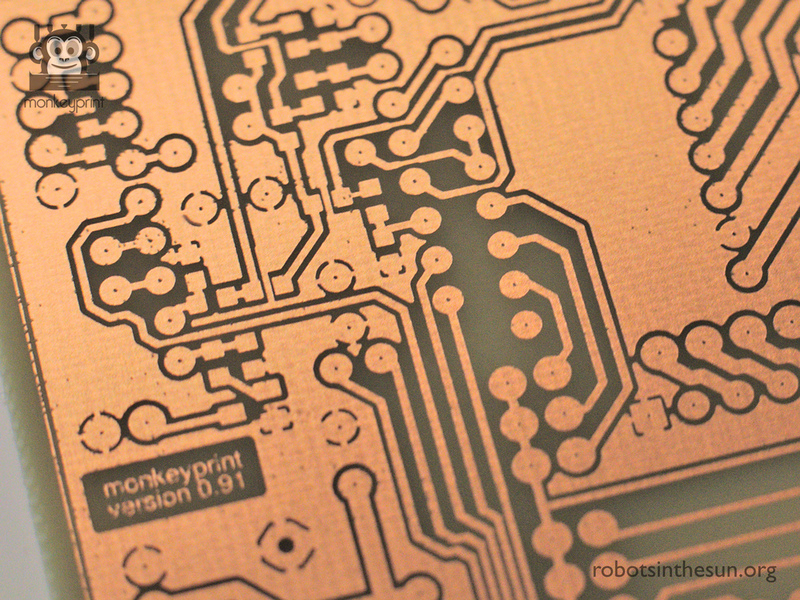 First of all, we need to make a mask that contains the layout of the Monkeyprint DLP printer board. Traces and pads need to be black and everything else transparent. You will find the layout as a pdf file in DIN A4 format in the hardware folder of your Monkeyprint directory. 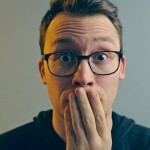 If you don’t have it already, check it out on my Github. The best way to make the mask is to have your local print shop expose the layout onto transparent film. This results in a superior quality mask as the resolution is very high. The cost is about 7 € in the print shop of my choice for a DIN A4 film. As an alternative, you can print onto transparent foil (overhead slides) using a laser printer. Make sure to use A4 format and 100% scaling! 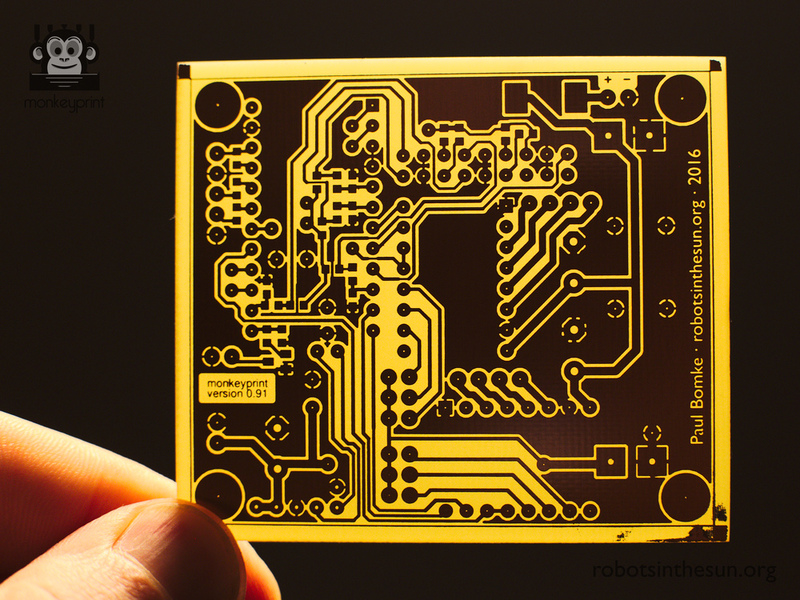 A PCB with photo resist coating. 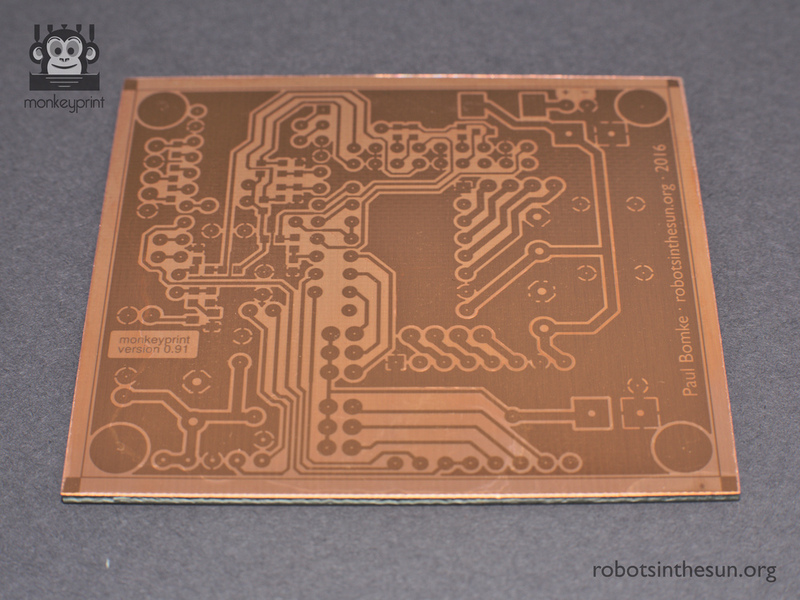 I use Bungard PCBs as they work really well. 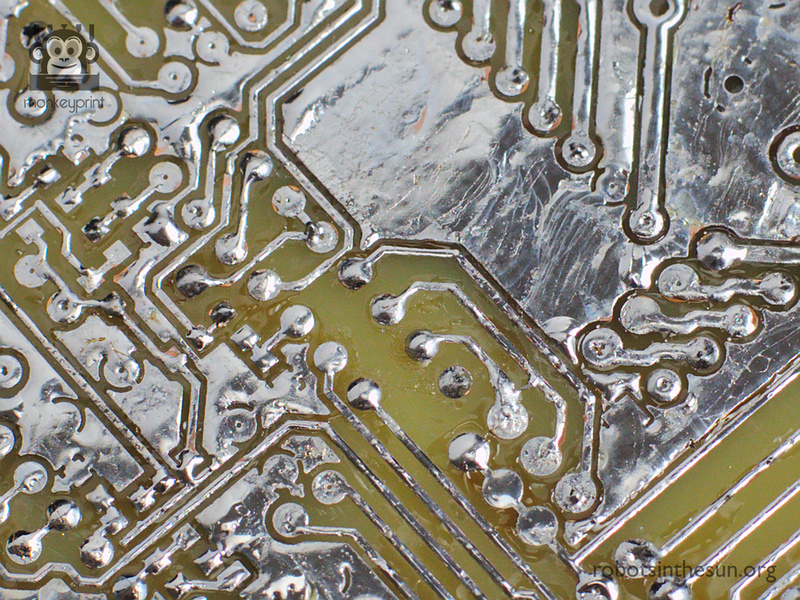 Pay attention to the best before date: PCBs that are too old might not work anymore as the etch resist degrades over time. A Jigsaw, pen and ruler. 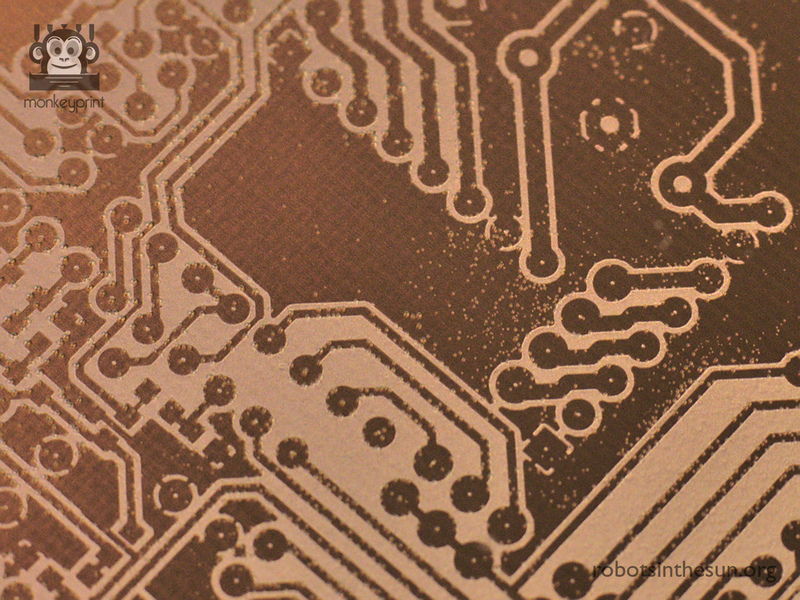 Mark a rectangular area of 69 x 60 mm on the PCBs cover foil. This is larger than the layout by 2 mm on all sides, which can be advantageous as the etch resist will sometimes be damaged on the edges. Then, cut out the marked area. I cut the PCB with a jigsaw. Make sure to deburr the edges, especially on the copper plated side as the exposure mask needs to lay down really flat onto the board later on. In the next step you are exposing and developing the PCB. The exposure will be done using UV light and the exposure mask. After the exposure the board needs to be developed. This will wash away the photo resist where it has been exposed to the UV light and leave the resist only where the layout mask was black. A cheap nail polish curing lamp. You can get it on eBay for about 15 €. You only need to install two of the four UV lamps provided. A glass plate of about 100 x 100 mm. Clean it with some ethanol or window cleaning detergent. An etch resistant flat (glass) basin. Developing solution. For Bungard PCBs use 20 grams of NaOH in 1 liter of water. If you use different material refer to the data sheet or manual. Danger! NaOH is corrosive and might lead to serious injury on skin or eye contact. Wear gloves and safety goggles, do not eat or drink during the process. Before you start, pour some developing solution into the basin and heat it up to about 50° C. Also make sure your UV lamp is plugged in and operational and your glass plate and exposure mask is at hand. Peel the sticky tape from the PCB. Keep the tape. Warning: handle the board with care! 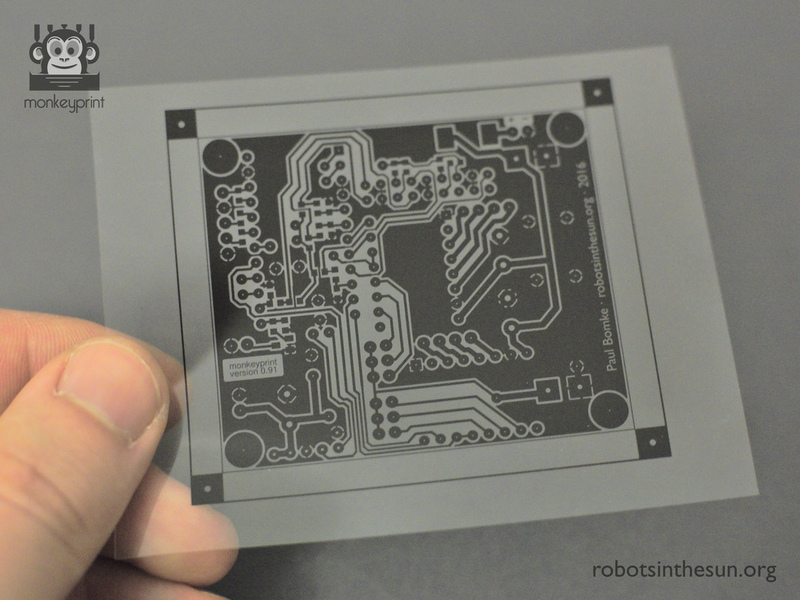 The etch resist is easily scratched which may result in defective circuitry. 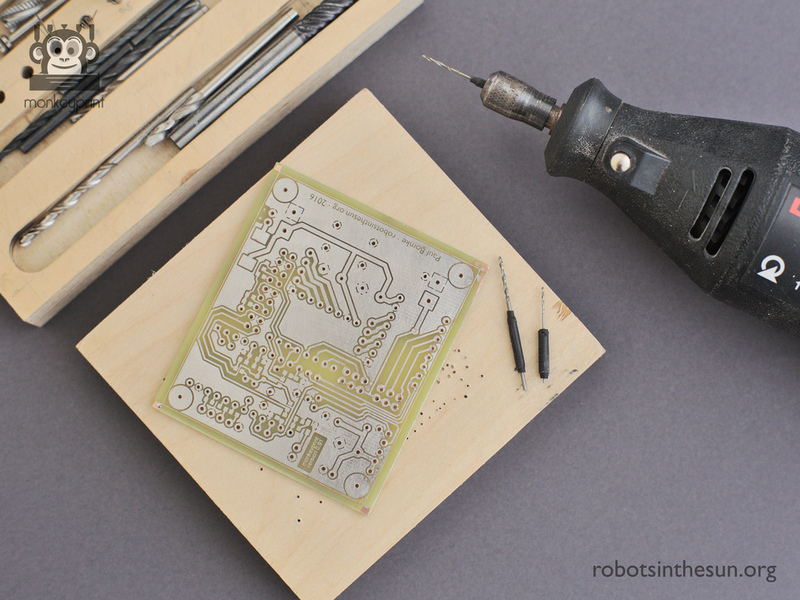 Place the board on a table, center the layout mask on the PCB and carefully put the glass plate on top. Then, cover the whole thing with the UV lamp and switch it on for 2 minutes. 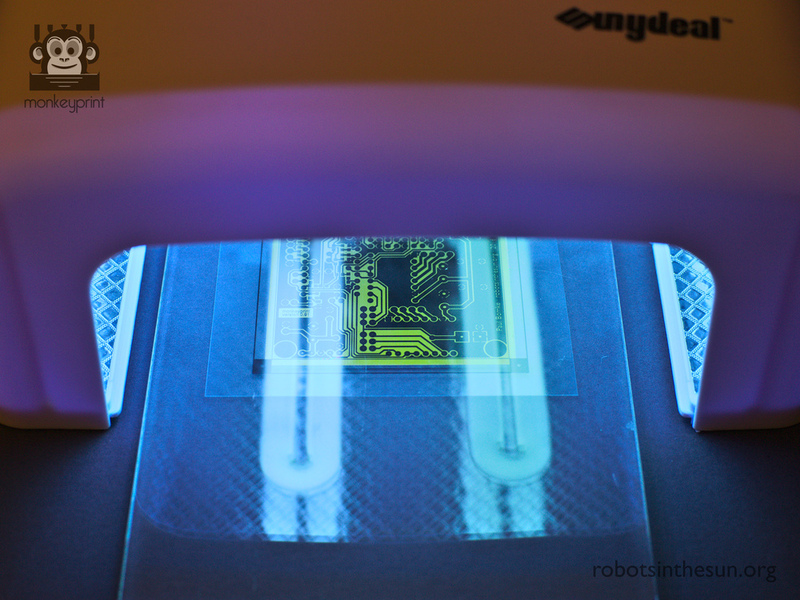 The exposure time may vary with different PCB manufacturers, so check your data sheet. 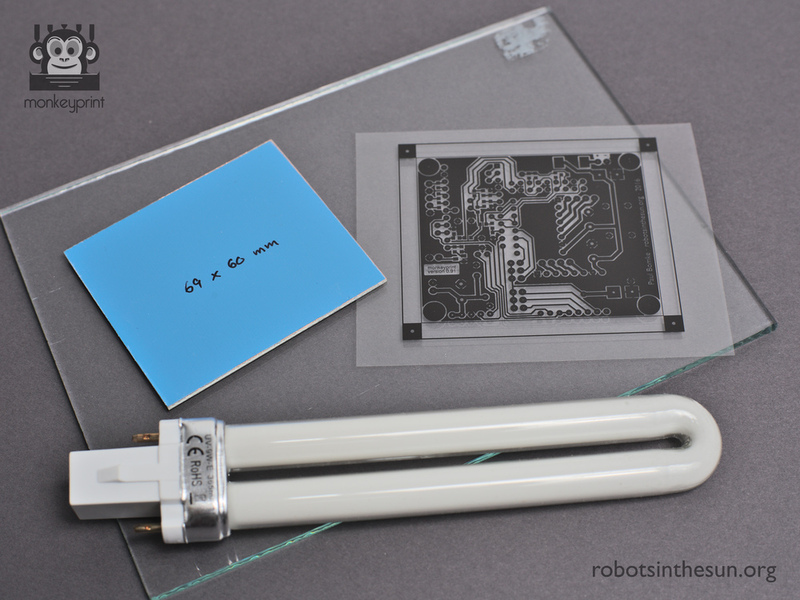 Then, switch off the lamp, remove the glass plate and layout mask and submerge the board in the developing solution. The development takes only seconds and you should immediately see the layout emerging on the board. 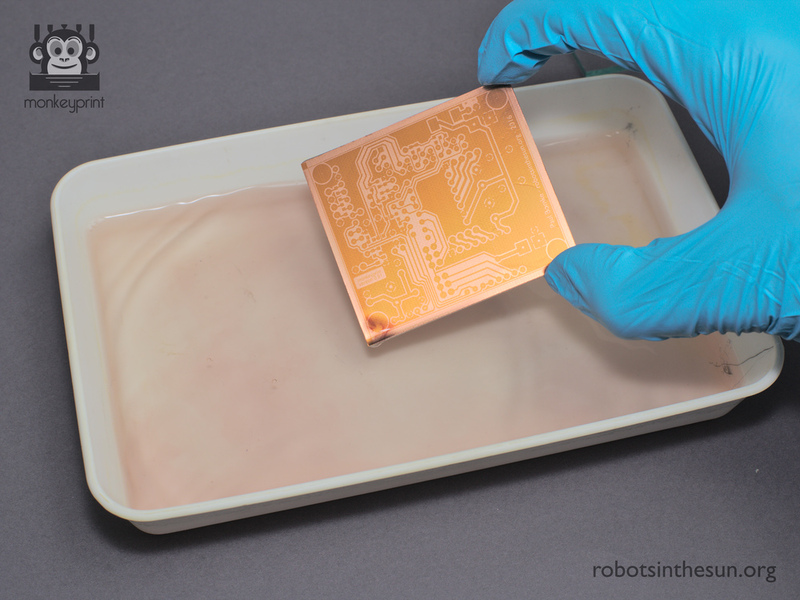 Shake the board a little and once the layout is clearly visible remove it from the solution and rinse it in water. Congratulations! You now have completed the most critical step of the process. The board is now insensitive to light and ready to be etched. 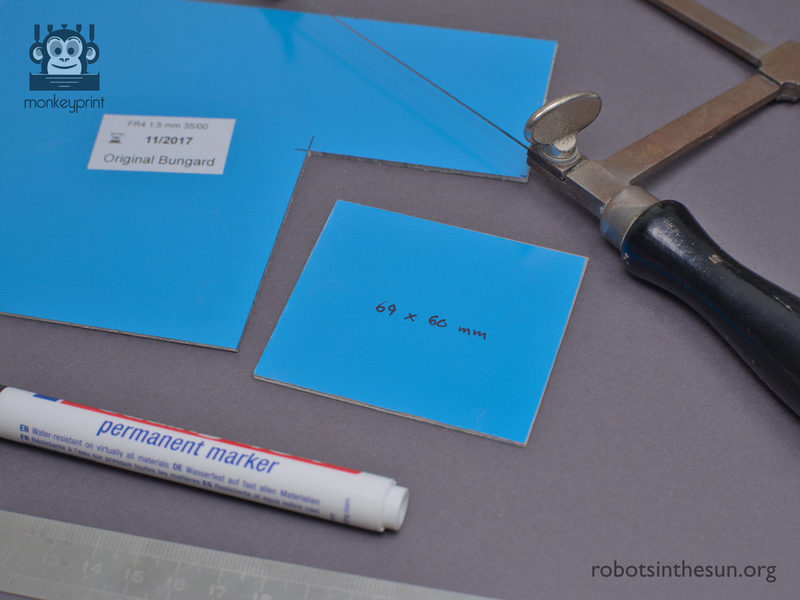 If you do not want to do the etching right now, cover it with the sticky tape again to protect the etch resist. This is what the board looks like after the exposure and development process. The dark parts are still masked by the etch resist. 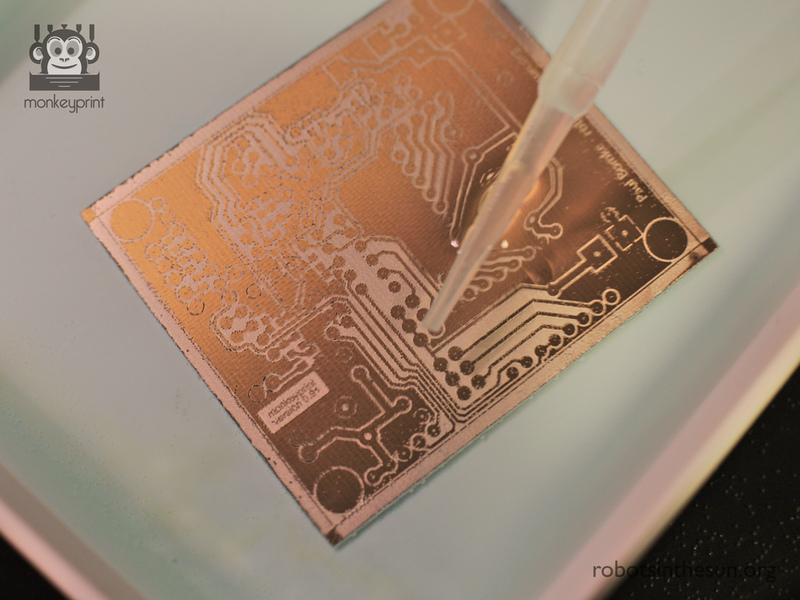 During this step you will etch away the copper where the etch resist has been removed from the board in the previous step. The exposed and developed board. An etch resistant flat basin and etch resistant pliers. Etching solution. Some use ferric oxide, I use sodium persulfate (Na2S2O8). You can buy it in a drug store or at your electronics supplier. Dissolve 250 grams in one liter of water. Danger! Na2S2O8 is corrosive and might lead to serious injury on skin or eye contact. Wear gloves and safety goggles, do not eat or drink during the process. Na2S2O8 will gradually release oxygen during storage. Use a bottle with an overpressure valve, otherwise your container might burst. Place the developed PCB inside the basin. 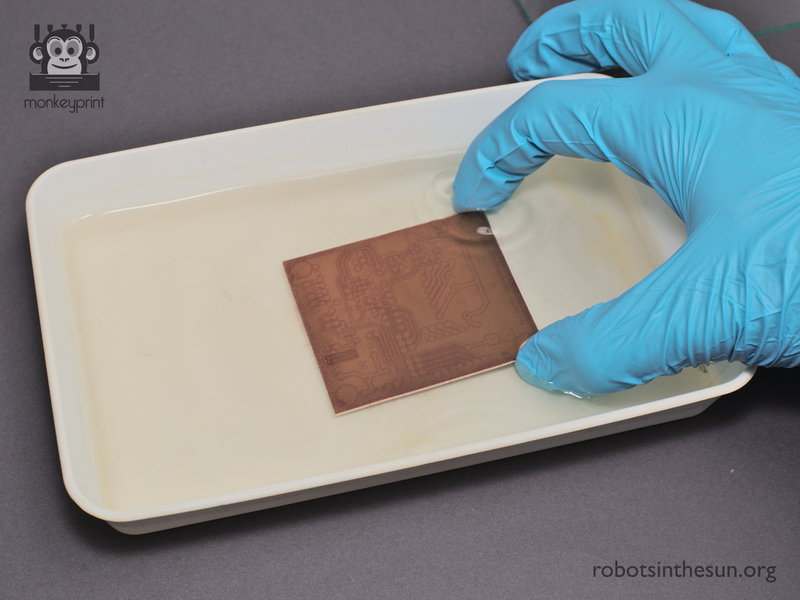 The etching will take some minutes, depending on the temperature and how copper saturated your etching solution already is. 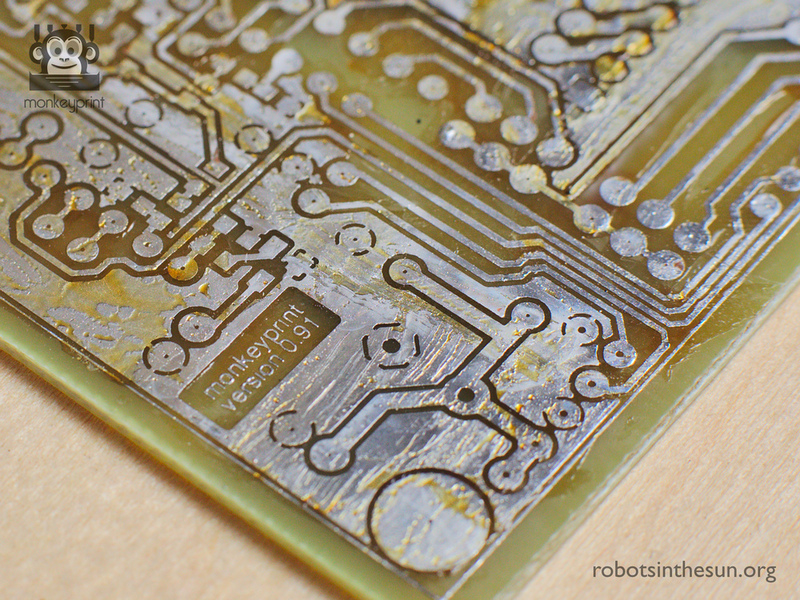 You can tell the etching progress from the exposed parts of the board becoming brighter and matte. Also, your etching solution will start getting blueish from the copper ions. You will see some bubbles forming on the board. “Blow” them away with a pipette or shake the board a little with the tweezers. Constant motion will also accelerate the etching process. The small, thin regions between traces are usually the first do be etched away. Once all exposed parts are free of copper, remove the board from the basin and rinse it in clear water. Before stowing away your etching utensils inspect the result optically by holding it against a light source. Should you see any unwanted connections between traces put the board back into the etching solution. 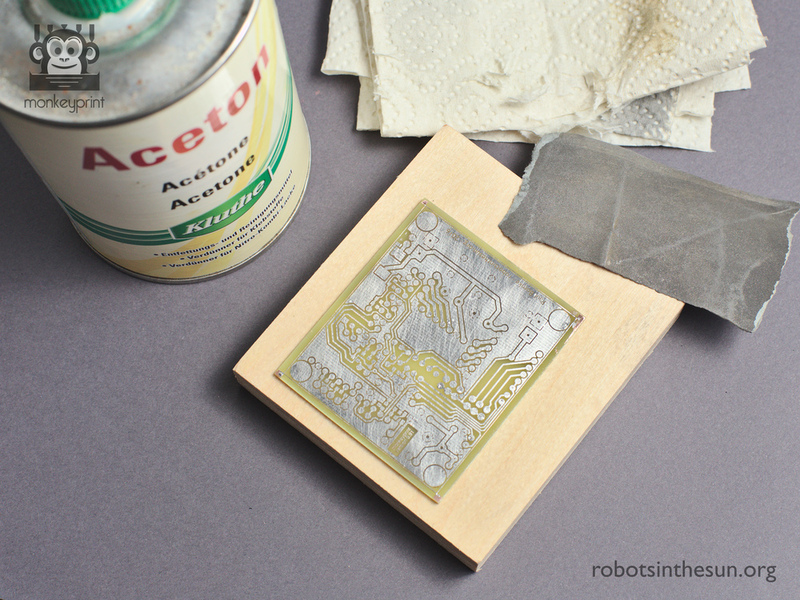 If you are pleased with the results of the etching process, you can wash off the remaining etch resist from the pads and traces using acetone. Use gloves as acetone dissolves your skins lipid layer. Make sure not to touch the board with your fingers to avoid tarnishing of the copper. 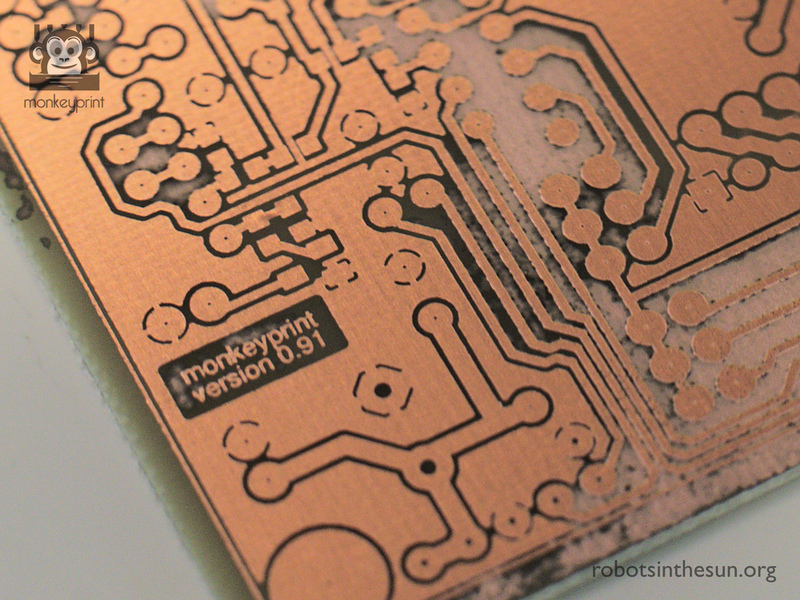 You have finished the etching process and are now holding your first Monkeyprint DLP printer board in your hands. The finished Monkeyprint DLP printer board. This step is optional. 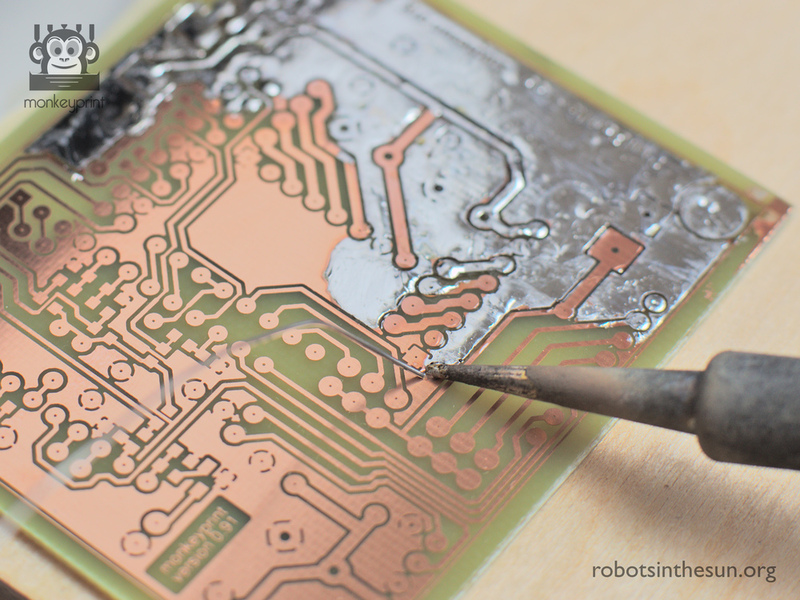 Tin coating the board prevents corrosion of the copper and makes the soldering a little easier. It also looks better (which is the main reason why I like it). – Solder. I use Sn62Pb36Cu2 with a flux core. – Solder wick. Apply some flux onto the wick for better results. First, cover all the copper with solder. Use as little solder as possible. 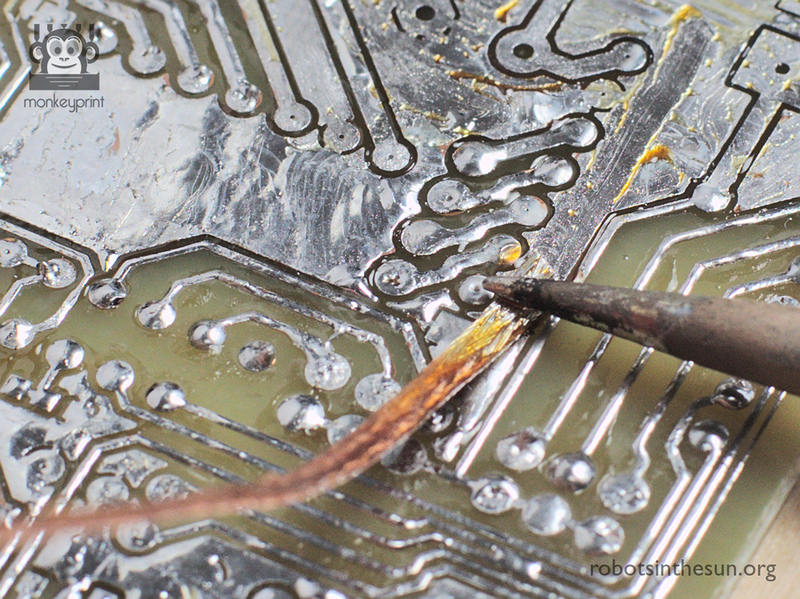 Keep the soldering iron in contact with the board while moving it around and applying the solder at the region of the irons tip. This is what the board looks like when first step of the tin coating is done. Then, use the solder wick to collect all the excess solder. Push it onto the board with the soldering iron and move it around until it has sucked up all the excess solder. You might need some 50 cm of wick to get the board done. After cleaning off the residue tin, the coating is thin and even. Only some flux remains. Clean away the flux using acetone. I also tend to carefully sand the board (grit 600–1000) to give it a nice and even finish. The last step is very easy and straight-forward. 0.8 and 1.0 mm drill. Place the board onto a flat piece of wood and drill all holes with a diameter of 0.8 mm. Then, drill the holes for the angled connectors, the straight connectors and the step down converter with 1.0 mm. Drill the mounting holes with 3.5 mm. Cut off the offset edges up to the thin line around the layout. You can use the jigsaw again to do this. Make sure to sand the etches to get a smooth finish. The drilling is the last step in the process of making your own Monkeyprint DLP printer board. I didn’t have a drill chuck small enough to hold the tiny drills so I put some heat shrink over the shafts. Works like a charm! 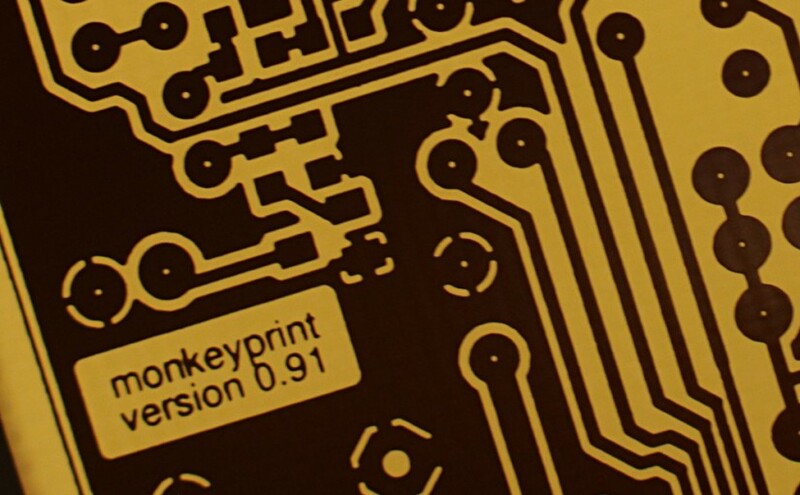 You now hold your first, self-made Monkeyprint board in your hands. Congratulations! In the upcoming part of this tutorial I will show you how to solder the components and connect your PC and the other peripherals. If you encounter any problems, have questions or remarks, please comment below!